America does not produce royalty…at least not too often. There was Princess Grace (Kelly) of Monaco, and we have Queen Noor of Jordan, but do you know about Principessa Rita Boncompagni Ludovisi of Rome? La Principessa is the former Rita Jenrette, a name which especially my Texas readers may remember. Rather then go into much about her, I offer this link, “The Renovation,” from the New Yorker as a bit of background. Rita Jenrette Boncompagni Ludovisi explains the family crest and history of the villa. Now back to my story. Wednesday evening I was invited on a special tour with a group from the Embassy. 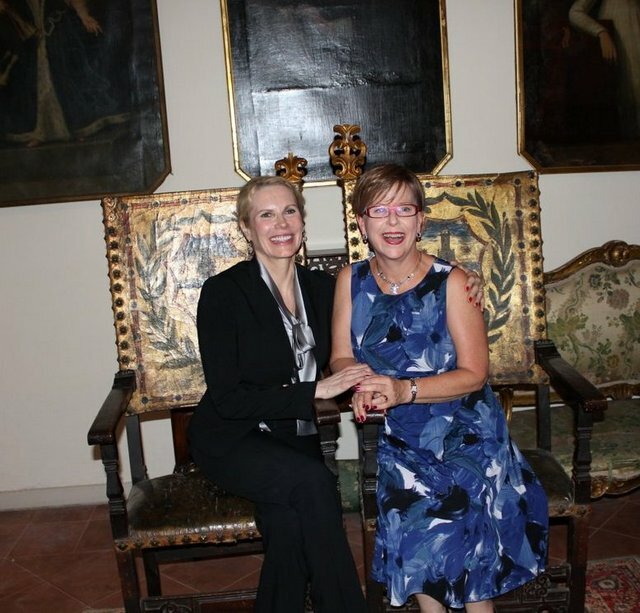 I am a docent for the Embassy and give tours, so I have been immersing myself in the history of the fabulous estate, which dates back to the time of Julius Caesar. When an American hears the word “villa,” we think “big fancy house.” Here a villa is often a park-like estate (Villa Borghese), with several buildings which may be grand palazzi (palaces) or simpler hunting lodges and villas as in the large-house definition. Back in the day (think the Renaissance and the Baroque Period), Villa Ludovisi surrounded and included the site of the U.S. Embassy, the Palazzo Margherita. It comprised many acres and included several palazzi. It had been transformed over the years in many ways, and the property was sub-divided in the 19th century to create the great neighborhood surrounding the Via Veneto. The tree Henry James sat under and wrote about. 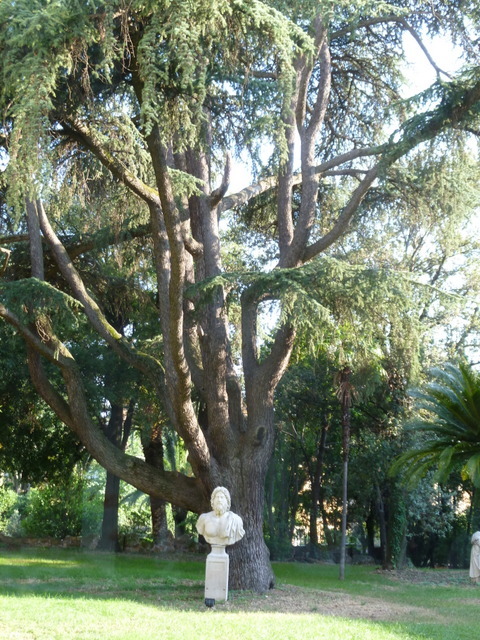 A mere stone’s throw from the Embassy is the charming Casino dell’Aurora, once part of this vast Villa Ludovisi, and now the home of the Boncampagni Ludovisi family. La Principessa Rita is overseeing the renovation of the house and the preservation of the historical documents and priceless art within. 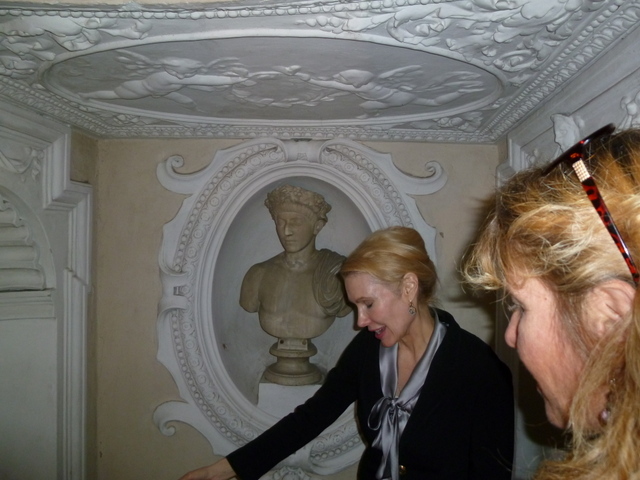 She personally conducted a delightful tour and greatly increased my understanding of this noble family. She is bright, articulate, kind, and passionate about her project, this fabulous renovation. Goethe, Henry James, Stendahl, and Nathaniel Hawthorne were only a few of the historic and notable guests. The family boasts two popes, one of which was Pope Gregorio, he of Gregorian calendar fame. I was privileged to see some of the original sketches created during the research of the calendar. Can you imagine? Original sketches from the 16th century? Imagine having this over your dining room table? 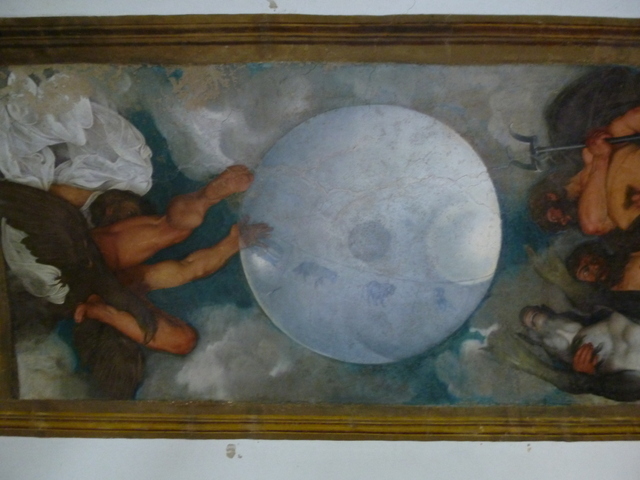 Fresco by Guercino, one of the most famous artists of his day. 17th Century, baroque. There is a Michelangelo in the garden, frescoes by Guercino, and the only Caravaggio ever painted on a ceiling; not a fresco but in oil. My knowledge of famous Italian artists is growing, but I cannot begin to describe the who-and-what of everything in this very private museum. The art alone is valued beyond €300,000,000. Bill Gates once offered to buy the place, practically sight unseen. Amazingly, only within the past two years, ruins beneath the villa were discovered that are believed to be those of one of Julius Caesar’s palaces, conjectured to be the place he wooed Cleopatra when she was in Rome. Princess Rita is a natural story-teller as one would expect from a Texan. What a joy it was to see this villa and meet the princess from Texas! 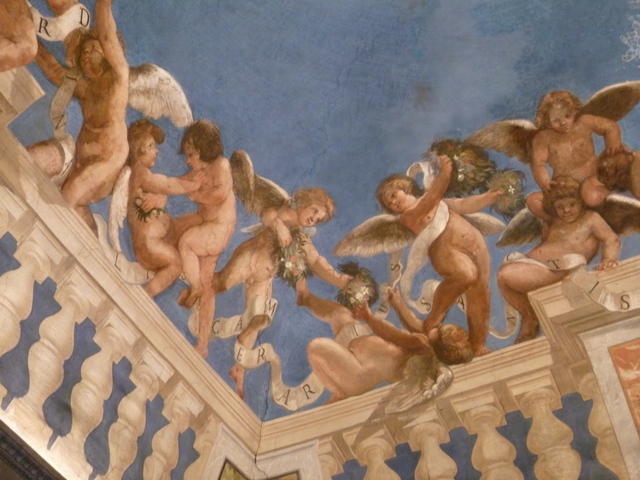 Playful fresco with putti. Original, never restored; from the 16th Century. Rita with bust of Julius Caesar, who had a palace on the same site, it seems. Only Caravaggio ever painted on a ceiling. Too large for me to capture completely, sorry. La Principessa and me. She remained cool on a hot day and I was melting. Perhaps her Texas blood prepared her for Rome. The chairs are papal “thrones” about 450 years old. What a life moment! You must have felt the golden thread of history while exploring the villa. Thank you for sharing this. Indeed I feel “that golden thread of history” (well put!) almost daily here! As always, thank you for sharing! You, too, are a generous and gentile lady! Two of my favorite things — a Texan — and Caravaggio. I see now I am going to end up stealing this and using it in my blog!! Happy to have you re-blog! I must do the same for you one day. We are traveling and having too much fun! Hoping to get a post done tonight, Day 4 of our trip. What a fabulous tour. I am so envious!! And gosh, I do remember Rita Jenrette from those Washington days– she’s managed to transform herself into Princess Boncompagni Ludovisi — not bad!! If I can put together a little tour later this summer or early fall, I’ll let you know. Yes, Rita has reinvented herself wonderfully. She has an amazing story and is very very smart! Always glad to hear about good Texas people 🙂 She sounds like a true Southern lady. What an incredible experience for you to meet her and enjoy her tour. You’d love her, Anita. Truly you would. WOW! What a wonderful evening. This is a fabulous blog of your experience. It was also interesting to me to read what has become of Rita J. I didn’t know this about her. Only knew the before stuff. Grazie, Cara Carolyn! This is a woman who has reinvented herself and has the strength to carry through this amazing project of preserving the past. I can think of very few experiences, venues, visits, that could possibly top this one. A Caravaggio on the ceiing, and the palace where Cleopatra stayed beneath the floor?! I am afraid life could be all down hill from here. Its seems as if this Princess who began in Texas is just the kind of person who would be capable of appreciating the amazing art and historical pieces, and is also able to steward their restoration. I am so glad you are a docent, Laurel, and had the chance to experience this. And to share it. THANKS! Oh I still have hills to climb, literally and figuratively. But it was a true pleasure to see! What a FABULOUS treat for you!! …and us … thank you for sharing! It was indeed a treat. Not open to the general public, and such a warm and gentile lady.